ww2dbaseHarold Rupert Leofric George Alexander was born into royalty as the third son of the fourth Earl of Caledon and Lady Elizabeth Graham Toler. He attended the Harrow School in London, England, United Kingdom as a boy, and went on to attend the Royal Military Academy Sandhurst in Berkshire, England. Upon graduation from Sandhurst, he was commissioned into the Irish Guards in 1911. He was a veteran of WW1, during which he was wounded four times and received the Military Cross, the Distinguished Service Order, and the Legion of Honor. Between 1919 and 1920, he commanded Latvians successfully against the Bolshevik takeover during the Russian Civil War. In the early 1920s, he served in Turkey and Gibraltar. In 1926, he was appointed to the Staff College, Camberley in Surrey, England. Between 1930 and 1931, he attended the Imperial Defense College. Between 1934 and 1936, he saw fighting on the Indian northwestern frontier. He was promoted to the rank of major general in 1937, the youngest of the British Army to hold that title at the time. In Oct 1937, he briefly served as King George VI's aide-de-camp. ww2dbaseEarly in WW2, Alexander suffered defeat in France as an officer of the British Expeditionary Force, and retreated with the Allied forces at Dunkirk, France. He then led British and Commonwealth troops in Burma, where he once again was unable to halt the oncoming invasion, and retreated to India. 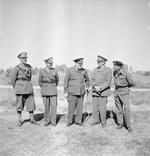 In Aug 1942, he was sent to North Africa to replace Claude Auchinleck as the theater commander. He later became General Dwight Eisenhower's deputy and the highest ranking British in the theater. During his tenure under Eisenhower, he earned the Supreme Commander's utmost respect; "I regarded Alexander as Britain's outstanding soldier in the field of strategy", the American said. "He was, moreover, a friendly and agreeable type; Americans instinctively liked him." ww2dbaseAt the conclusion of the North African and Sicilian campaigns, Eisenhower was named the commander of the upcoming Normandy landings. Eisenhower wished to continue using Alexander as his deputy, but Prime Minister Winston Churchill insisted that Alexander would be better utilized in southern Europe. Alexander, therefore, remained and became the Supreme Allied Commander in Italy. In Jan 1944, Alexander launched a new offensive against the German Gustav Line of defense. The new assault on Monte Cassino coupled with an amphibious operation at Anzio broke the German 10the Army, but destroyed the sixth-century monastary of Monte Cassino. ww2dbaseAfter the war, Alexander was made Viscount Alexander of Tunis in 1946. In Dec 1946 he was made a Knight of the Garter. He gained the title of Earl in 1952 during his tenure as the last Governor General of Canada. He was loved by the people of Canada; in one instance early on as Governor General, he was named Honorary Chief by the Kwakiutl people of Western Canada, then later Chief Eagle Head by the Blackfoot people. He devoted his career in Canada to understand the needs of his people and to improve the economy. ww2dbaseAlexander returned to Britain to assume the responsibility of the Minister of Defense in 1952. He retired from politics only two years later. He passed away in 1969, and now rests in peace in Ridge, Hertfordshire, England. 10 Dec 1891 Harold Alexander was born. 4 Mar 1942 Harold Alexander arrived in Burma. 15 May 1942 British General Harold Alexander arrived at Imphal, India. 24 Dec 1943 Sir Henry Maitland Wilson was designated Supreme Allied Commander Mediterranean, with General Harold Alexander as the Commander-in-Chief of Allied Armies in Italy under him. 14 Feb 1944 Harold Alexander visited the Allied beachhead at Anzio, Italy and was dissatisfied with the commanding officer Major General John Lucas. 31 Jul 1945 British King George VI approved the appointment of Field-Marshal Sir Harold Alexander as Governor-General of Canada. He will succeed the Earl of Athlone who has held the office since 1940. 16 Jun 1969 Harold Alexander passed away.